The interest rate spreads on corporate bonds to US treasury securities narrowed in July to levels that existed before Lehman Brothers filed for bankruptcy protection in September 2008, as investors increased their risk-taking behavior and the perception of counterparty risk receded. 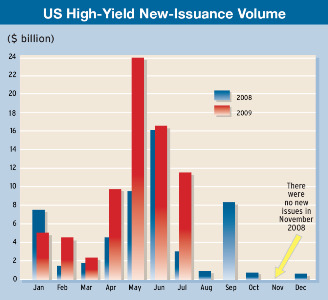 July’s performance officially marked the return to pre-Lehman price levels for high-yield debt and leveraged loans, according to a Banc of America Securities-Merrill Lynch research report. Prices of the most actively traded risky loans reached their highest levels in more than a year. “July’s market return roundup highlights the remarkable speed with which credit markets have healed following last September’s Lehman bankruptcy,” according to the report by Jeff Rosenberg, head of global credit strategy. 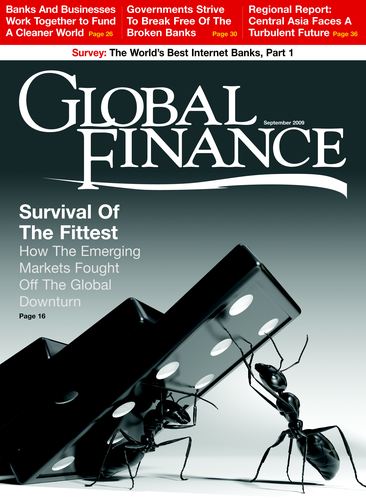 It says that other signs of health in the credit markets in July included the issuance of financial capital securities, robust primary market issuance, the near failure of CIT without systemic risk consequence, expanded structured-credit activity and second-quarter profits highlighting the success of trading results for financial institutions. Counterparty risk fell more than 25% in the last two weeks of July, says Dave Klein, manager of CDR Credit Indices. The California-based firm’s CDR Counterparty Risk Index, which is widely used to track the credit risk of major credit default swap counterparties, declined to 109.5 basis points at the end of July but was still well above its multi-year average of 80 basis points. “The high-yield market has produced phenomenal returns this year, including record returns in the second quarter,” says Robert McAdie, global head of credit strategy at Barclays Capital, based in London. “We still expect to see positive returns in the second half,” he says. There likely will be more differentiation around credits, however, and default rates will continue to rise, McAdie says. Banks are still pulling back from credit cards, and credit for small corporations is still tight, he says. The strongest performance in the fixed-income markets so far this year has come from high-yield bonds. “Only a few of the smaller emerging market equity markets have managed to keep pace with the 65% returns generated by CCC-rated debt so far this year,” according to a report by the economics department at Samba, based in Riyadh, Saudi Arabia. The outperformance of these bonds could soon be drawing to a close, however, as spreads approach the default and recovery rates expected in the current cycle, Samba says.